This article shows how to set up a Web API service which can support multiple languages and keep it simple. When localizing an application, it is important that all texts or references to language specific resources are not directly referenced in your business methods or code. Only the source or the presentation layer should convert the language keys to localized objects. 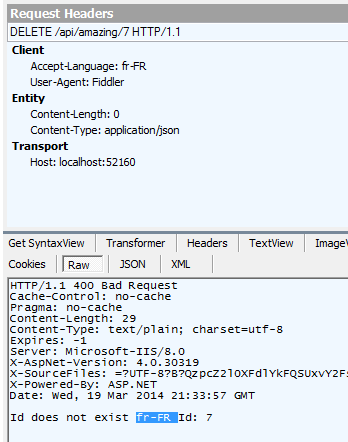 To add this feature to a web API service, a new MessageHandler can be created. 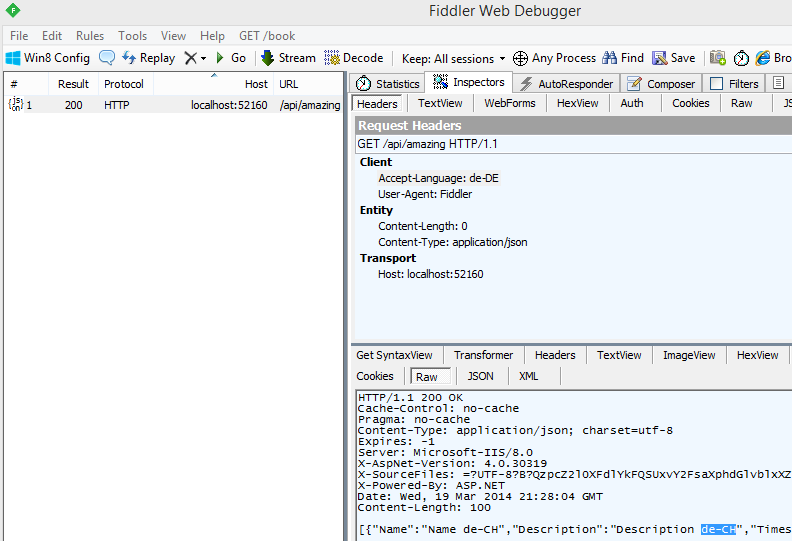 The message handler validates the request header for localized languages. If the request supplies a supported language, the first one found is used. If none are found, a global search is activated. If a language globalization matches a supported globalization, the first found supported localization for this language is used. For example in the demo app de-DE => de-CH. If none are found, the default localization is used. 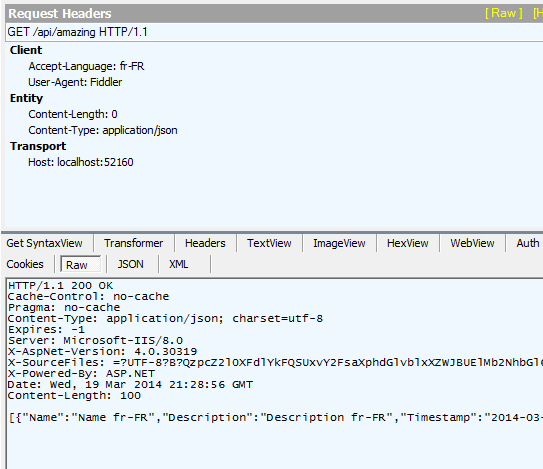 The LanguageMessageHandler class is then added to the global config for the Web API. The translations are added to Resource files in the application. The demo app supports de-CH, fr-FR and the default language en-GB. Resource files don’t have to be used, translations could be in a database. The Model class MyPayload used the translations for its validation. If a required validation exception occurs, the validation message will be displayed in the localized culture. The action controller does not required any specific language methods. The get works for all cultures. Here’s a test result of a Get in the fr-FR localization. And here’s a test result of a Get in the de-DE localization. This is changed to a de-CH. The action controller uses the ModelState to validate the create object request in the Post method. If the Model is invalid, a HttpError object is created from the ModelState. The BadRequest(ModelState) provided by the framework cannot be used, because this method results in non-localized strings. Because the BadRequest cannot be used, the HttpError is created in a private method. The following diagram shows that the model validation works and returns a localized string. 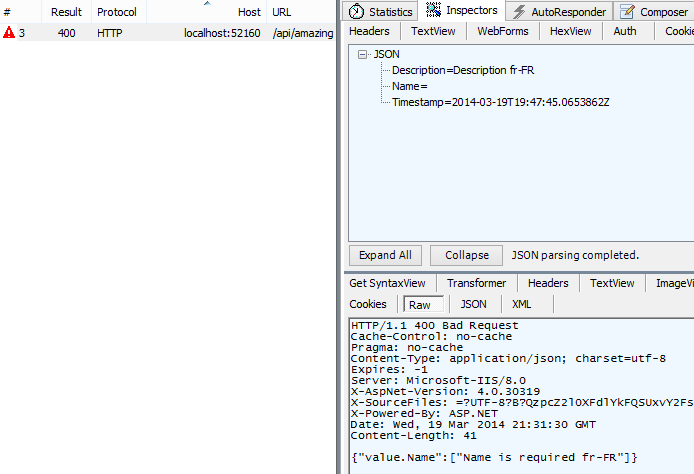 The delete method returns a HttpResponseMessage with a localized string. Here’ a test result with validation errors. If required, the validation logic could be added to an ActionController and other checks could be implemented, for example Model = null or whatever. Define a fix set of localizations to support. Do not try to support everything. Choose one localization for each global language unless the software requirements require different. You should support runtime language switches. If an application requires a restart or after a language change, the user ends up at a different URL, that’s just not USER friendly software, just bad software design and bad software architecture. Get professional! Be careful when guessing a user language for the end user. And if doing this make it VERY EASY for the end user to change back to the preferred language. For example the automatic translation tools based on location are terrible. Some don’t even use the browser headers. If doing this, then cache the user settings. If programming a MVC or browser application, use language parameters in the URL and not browser headers. This is not the case for Web API, as it’s supplying a service. You can use it how you want. The interface is really intuitive and they’ve got great support! Very good! I was looking for means like these to trigger WebAPI localization and your implementation of `LanguageMessageHandler` pointed me to the right approach. Thanks for the article! It works great! // Set the language in the response header for easier debugging. Then add “app.Use(typeof(AcceptLanguageMiddleware));” to your OWIN startup class. The GetErrors private method that you implemented is already in the constructor of the HttpError class, why reimplement it? In my case I just instantiated a new one passing it my ModelStateDictionary and it worked as expected.